We have just met together as elders of my church to discuss the importance and power of reading the Bible out load. Particularly in the context of reading the Bible at a public meeting. So often the Bible is done in a flat monotone way with no concept of the drama and passion of the writing. It was great to enthuse one another with how things could be if we gathered together a small group of people who love the Scriptures and are willing to take time to improve their public reading skills who then become our regular readers. 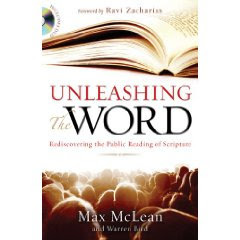 We were greatly helped by reference to Max Maclean's excellent book, Unleashing the word'.